What It’s About: Overworked, stressed out air traffic controller Jack Chester (John Candy) takes his family to a rented beach house for a much-needed vacation. In addition to the usual vacation annoyances Chester runs afoul of local big wig Al Pellet (Richard Crenna), a feud that eventually results in Chester attempting to beat Pellet in the Citrus Cove Regatta, a yacht race. Can his ally/trainer/mentor/drinking buddy/seaman turned restaurateur Scully (Rip Torn) help Chester win the race and his family’s respect? Why Watch it Today? : The Citrus Cove Regatta takes place on this date in the film. 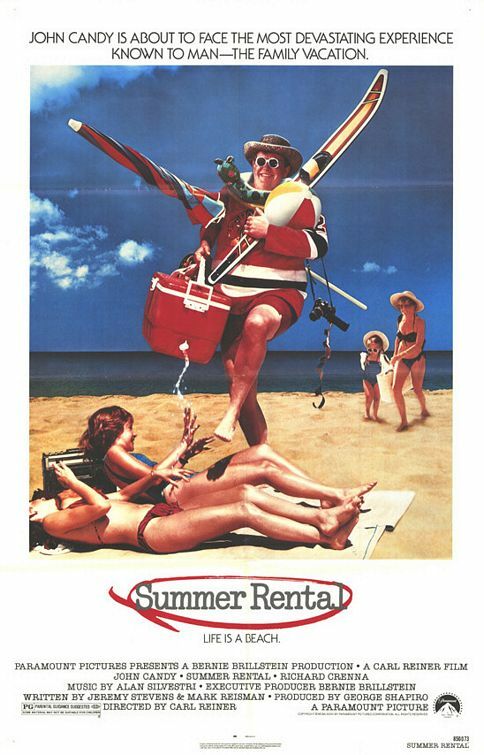 Summer Rental is definitely the lesser of Candy’s two family vacation comedies, lacking the punch of The Great Outdoors’ rivalry between Candy and slimy Uncle Roman (as played by Dan Akroyd), but it’s still an enjoyable watch if you enjoy Candy and are in the mood for a snobs vs. slobs competition with an interesting supporting cast (Crenna is a joy to watch as he throws restraint to the wind). This entry was posted in Comedy, Fish-Out-of-Water, Movie of the Day, Slapstick and tagged Alan Silvestri, apprentice/mentor relationship, beach, bet, Carl Reiner, cast, family, father, John Candy, Joseph Lawrence, Kerri Green, Paramount Pictures, regatta, Reni Santoni, rental home, Richard Crenna, Rip Torn, snobs vs. slobs, snooty restaurant, yacht.